Tiny plant cells called zooxanthellae live within most types of coral polyps. They provide the coral with foods resulting from photosynthesis. Click the image for a larger view of these cells. and amino acids, which are the products of photosynthesis. The coral uses these products to make proteins, fats, and carbohydrates, and produce calcium carbonate (Barnes, R.D., 1987; Barnes, R.S.K. and Hughes, 1999; Lalli and Parsons, 1995; Levinton, 1995; Sumich, 1996). The relationship between the algae and coral polyp facilitates a tight recycling of nutrients in nutrient-poor tropical waters. 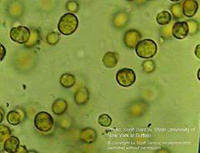 In fact, as much as 90 percent of the organic material photosynthetically produced by the zooxanthellae is transferred to the host coral tissue (Sumich, 1996). This is the driving force behind the growth and productivity of coral reefs (Barnes, 1987; Levinton, 1995). In addition to providing corals with essential nutrients, zooxanthellae are responsible for the unique and beautiful colors of many stony corals. Sometimes when corals become physically stressed, the polyps expel their algal cells and the colony takes on a stark white appearance. This is commonly described as “coral bleaching” (Barnes, R.S.K. and Hughes, 1999; Lalli and Parsons, 1995). If the polyps go for too long without zooxanthellae, coral bleaching can result in the coral's death. Because of their intimate relationship with zooxanthellae, reef-building corals respond to the environment like plants. Because their algal cells need light for photosynthesis, reef corals require clear water. For this reason they are generally found only in waters with small amounts of suspended material, i.e., in water of low turbidity and low productivity. This leads to an interesting paradox—coral reefs require clear, nutrient-poor water, but they are among the most productive and diverse marine environments (Barnes, 1987). Coral polyps, which are animals, and zooxanthellae, the plant cells that live within them, have a mutualistic relationship. Click the image to see an animation. Zooxanthellae cells provide corals with pigmentation. On the left is a healthy stony coral. On the right is a stony coral that has lost its zooxanthellae cells and bleached. Click the image for a larger view.